So there’s this book called The New Smithsonian Book of Comic-Book Stories and you should read it. Now. That is, if you’re into comic books(UMW students who have access to this book through your school library, I’m looking at you). If you’re not into them then don’t bother because not being into comic books means you’re not interested in reading the horrendously honest humor of R. Crumb, mundane splendor of Harvey Pekar, legendary duo Stan Lee and Jack Kirby, monumental works of Art Spiegelman, haunting hilarity of Charles Burns, wonderful character studies by Daniel Clowes, beautiful melancholia of Chris Ware, or the psychedelic wordless Frank by Jim Woodring. All the stories offered in this compilation are a great introduction to some of the best comic artist in the industry. Some of them are simply excerpts from greater works, others are short stories, but all of them are guaranteed to impress. That is, unless you’re not into comic books. These are not all of the artists included in this new edition; I can’t even promise they’re the best stories in here. If you want a full list of all the artists, along with the names of the stories, you can find the list here. Maybe you will find a name you recognize and save yourself the time otherwise spent listening to me try to convince you this stuff is good. If you don’t recognize any of these names however, here are the summaries of two stories that paint a pretty good picture of the quality of story you can expect to encounter when you pick up this book. 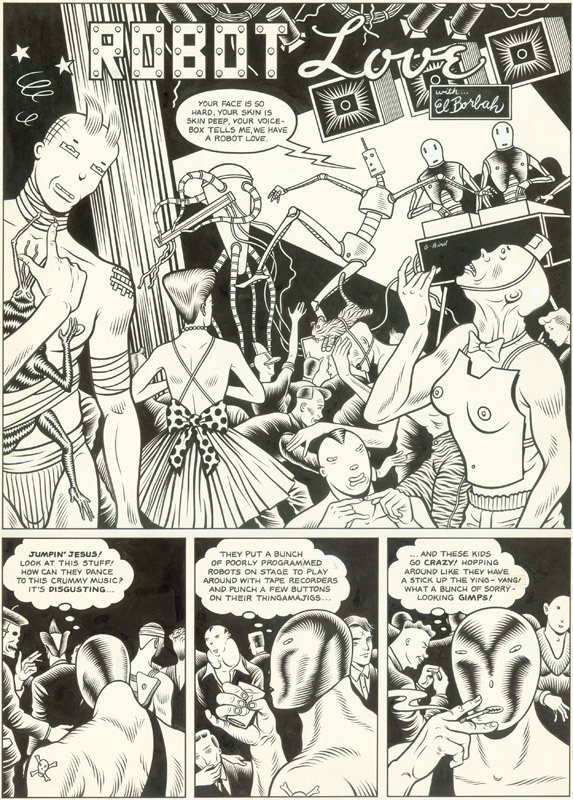 Charles Burns’ comic takes place in a nightmarish reality where deformities are about as common as pimples on the face of a fifteen year old boy, teenagers wear insects the size of plates as a fashion statement, and robots run the dance floor. This six page story follows a detective dressed as a luchador as he hunts in dance clubs for a missing teenager. This strangely whimsical story would fit nicely into the noir detective genre of it weren’t so outright strange. But I find this adds to its charm what with entertaining dialogue and excellent artwork; you might not know what it is you are looking at in this surreal world, but these sharp and crisp illustrations make sure you know exactly what the hell you are questioning looks like. If you haven’t read any of Charles Burns’ work, this is a great first step into this man’s strange but deeply poetic mind. Daniel Clowes’ short story follows Mal Rosen, a divorced 39 year old and traveling cartoonist. The story is narrated through his diary and it begins with the first entry where he introduces himself and his lifestyle of traveling from tent to tent and drawing caricatures of one uninteresting person to the next. He meets a young woman, she flatters him for his talent, after their second meeting they begin spending more time together, and soon they are holding hands and tensions are high. Caricature is unique in its brutal honesty. It is the portrait of a man and the relationship between him and his own growing isolation. The characters themselves look like caricatures, yet their expressions are often blank, apathetic, and betray the swirl of emotions we know are inside of them. At the same time, these expressions speak to the bitterness we ourselves hold towards the mundanity and loneliness in our own lives. Clowes’ caution in over exaggerating allows for closer observation, which reveals that rarely are facial expressions the same from one panel to the next. This masterful control allows for great dramatic moments in the story through the use of unique lighting and the introduction of a face we have never seen the character wear before. This story is full of subtle moments that make or break relationships, unpredictably large character development, and ends with the main character inadvertently discovering the deeper you look the darker it gets. If you have never experienced Daniel Clowes’ work before and this kind of story interest you, dive in. You won’t find anything like it anywhere else.